From the rolling hills of California to the mist-shrouded mountains of the Pacific Northwest, lies 1,478 miles of coastline dotted with modern metropolises and charming towns full of personality. Whether you’re looking for a relaxed week sampling local culinary delights through California’s renowned wine country, an adventurous trek along the rugged Pacific coastline, or the inside scoop on Hollywood’s entertainment industry, Princess Cruises offers the "Best in the West." Journey through the land of golden hills on roundtrip cruises departing from Los Angeles, San Francisco, Seattle and Vancouver, B.C. Gaze across Monterey’s mesmerizing shoreline from a waterfront eatery. Watch the fog roll in as you walk across the Golden Gate Bridge. Literally walk in the footsteps of screen legends at the Hollywood Walk of Fame. Let California’s laid-back spirit infuse every moment of your adventure from sea to shore. Drink wine so close to the source that you could reach out and touch the grapes on a Pacific Wine Country or Coastal cruise. Befriend a local who teaches you the best way to swirl world-famous reds in Napa. Uncover new layers in a glass of Sauvignon Blanc from a tasting room near the ocean in Santa Barbara. Discover the beauty of city life as you tour San Francisco by cable car with a newfound appreciation of a perfect California Coast pour. See how easy cruising can be as you explore the California Coast. Princess MedallionClass streamlines your vacation with everything from expedited boarding to drinks on demand, so you have more time to do what you love. Cuisine inspired by world–renowned chefs. Broadway-style entertainment from award-winning creators. Shore excursions crafted to immerse you into what makes the region truly unique. Princess knows that the journey and the destination aren’t separate, but together they make the most cherished memories. With 4- to 10-day sailings and departures from Los Angeles, San Francisco, Seattle, and Vancouver, B.C., it’s easy to see why Cruise Critic has named our California Coast cruises the "Best Cruises from the West Coast." Experience what draws people to California, from fog-covered redwood forests to bright lights and excitement. With spectacular ships offering everything you’d find at an seaside resort – from gourmet dining to world-class entertainment – there’s no better way to see the West Coast’s best cities, hidden gems and famed Wine Country than aboard our California Coast cruises. Savor a unique selection of California wines, and partake in our new Silverado Wine Blending Experience. Sample cuisine from some of L.A.’s hottest chefs, such as Curtis Stone and Ernesto Uchimura. Our Entertainer’s Showcase features Hollywood insiders, from actors to musicians and writers, sharing stories and plying their craft. Princess also offers Discovery™ and California Science Center curated activities that explore California’s wildlife, history and national parks. We have a wide range of comfortable accommodations for families or friends traveling together. There is room for up to four guests in all types of staterooms — Interior, Oceanview, Balcony and Mini-Suites — many with interconnecting options too! For families or groups traveling with five or more members, we offer a Two-Bedroom Family Suite option — with room for up to eight people, luxury amenities and a comfortable sitting room. Wining and dining are integral parts of the California Coast experience. From fajitas and margaritas to wine-tasting events and local delights that celebrate fresh ingredients and exotic influences, Princess serves up a diverse menu of food and dining options throughout the day. We’ve partnered with three of L.A.’s hottest chefs – Curtis Stone, Ernesto Uchimura, and Angelo Auriana – to bring world-class cuisine to you. Have an artfully paired burger and beer at The Salty Dog Gastropub, modern-meets-rustic Italian at Sabatini's or a six-course experience at SHARE by Curtis Stone. California has always been at the forefront of cuisine, with its emphasis on fresh fruits and vegetables, delicate meat and seafood dishes and compelling presentation. Taste flavors and influences from countless cultures, including Europe, Mexico and Asia, in one-of-a-kind dining experiences only enjoyed on the California Coast. Master chocolatier Norman Love has designed some of the most decadent, hand-crafted treats in partnership with Princess for our exclusive Chocolate Journeys program. Invigorate your senses with premium chocolate and wine pairings at Vines wine bar. Share a plate of warm cookies with your family before settling down for the night. Sample artfully crafted chocolate cake with daily rotating creations. Excite your palate with gourmet pairings at Vines wine bar. Learn what makes California wine some of the best in the world through tastings and talks with experts. Experiment with flavors and aromas under expert guidance to create your own signature wine blend. Meet new friends while savoring fine wine selections served with hors d'oeuvres. Take in entertaining lectures by knowledgeable staff and compare California wines to those produced around the world during unique wine tastings. Perfect for wine enthusiasts, from the burgeoning to the experienced. Create your own malbec, cabernet franc, merlot and cabernet sauvignon blend under the instruction of a master craftsman from the Silverado Vineyards in California’s famed Napa Valley. In this exclusive onboard experience from Princess, watch and follow along as this skilled vintner instructs how to custom blend a wine that’s uniquely your own, practicing an art that winemakers around the world have been perfecting for centuries. Voted one of the "Best Wine Bars at Sea" by USA Today, Vines wine bar is a cozy nook for the casual oenophile to sit back and enjoy a glass of wine with gourmet pairings, like antipasti and tapas. Vines boasts an extensive collection, like Opus One, Super Tuscan styles, fine sparkling wines and regional offerings. Hollywood has always been the mecca for entertainment so it should come as no surprise that we bring the hottest talent to the Princess stages. Enjoy the best music, entertainment and craftsmanship of Hollywood and Broadway in this exclusive opportunity on board a Princess California Coast cruise. Laugh with top-ranked comedians from Comedy Central and comedy clubs across the U.S. When the laughter dies down, closely watch magicians from iconic L.A. hot spots like the Magic Castle, a members-only private club that specializes in jaw-dropping sleight of hand, as well as from Penn and Teller's television show Fool Us. Hear celebrities from your favorite entertainment share their experiences on board select sailings in our exclusive Entertainer’s Showcase and Workshop. Meet the stars of stage, screen and music at parties, and hear behind-the-scenes tales of your favorite movie, play or album over exquisite food and drinks. Meet the actors, composers and musicians who shaped some of the most memorable media in history and learn about their careers, methods and lives. Cuddle up under a cozy blanket with warm popcorn for an evening of Hollywood blockbusters. Enjoy popular comedies, dramas and action movies, plus on-screen concerts starring musical legends at Movies Under the Stars®, a poolside movie theater located on the ship’s top deck. Get to the heart of life on the coast with locally inspired programs and partnerships. Witness fantastic displays of nature like expressive sea lions and migrating whales. Learn about colorful, historical cultures and more on our California Coast cruise. Do as the locals do. Princess has partnered with local experts to bring you immersive adventure off the beaten path. Dine at local hot spots hidden in plain sight. Attend events and have experiences only known through word of mouth. Listen as experts reveal California’s history, national parks and Spanish missions from a local point of view. Experience a new perspective of California and the West Coast on board or ashore, day or night. Learn about California from the locals who know it best and uncover the secret lives of sharks during Shark Week at Sea with Discovery at SEA. Amaze your friends after a class at the Wizard’s Academy courtesy of the California Science Center. Embark on a cosmic voyage to the heavens from our top deck through Stargazing with Discovery at SEA, developed with renowned astrophysicist Hakeem Oluseyi and L.A.’s famous Griffith Observatory. On this interactive guided tour, learn how to find your bearings, identify the major constellations, and hear the secrets of the stars and the legends around them. Immerse yourself in the colorful sights and sounds of the Golden State and beyond. Locals wear the region’s signature laid-back spirit like a uniform. It’s in the sand, on the streets and in hole-in-the-wall restaurants. Pictures don’t do it justice; it has to be felt and experienced, and the best way to do so is with Princess. Uncover the history, natural wonders and culinary delights of the California Coast through shore excursions specially designed to show you more of the state. Inspire your mind with up-close encounters with fascinating creatures and sites on immersive Discovery™ and Animal Planet™ excursions. Princess has joined forces with Discovery to offer exclusive excursions and tours that are not only fascinating for the whole family, but also recommended by two of the most trusted names in world travel – Discovery™ and Animal Planet™. Hear inside stories from regional experts, and learn what it’s really like to live where you’re visiting. Astoria, OregonCatalina Island, CaliforniaEnsenada, MexicoLos Angeles, CaliforniaMonterey, CaliforniaSan Diego, CaliforniaSan Francisco, CaliforniaSanta Barbara, CaliforniaSeattle, WashingtonVancouver, B.C. Enjoy a narrated drive around Astoria, and visit the Astoria Column, view the Flavel House and many picturesque homes, hotels and neighborhoods that have been featured in movies like The Goonies, Short Circuit, Benji the Hunted and others. Take in the views and brews of some Astoria's finest craft beers while looking out over the scenic Columbia River. Just 22 miles long and eight miles wide, Catalina is a fairytale getaway. Kayak alongside dolphins and harbor seals. Snorkel in clear waters above shipwrecks. Surround yourself with the beauty of the island’s native flora and fauna in the Botanical Gardens. Admire the Art Deco architecture of the Avalon Casino, once the favorite haunt of Cary Grant, and keep your eyes open for bald eagles circling overhead at the Bald Eagle Habitat. Head south and dance to live mariachi music in the Riviera del Pacifico. Visit the oldest winery in Baja California, and enjoy the beautiful weather as you taste wines crafted from nearly ancient vines. Sample delectable dishes under beach umbrellas, and enjoy the day’s special from local street vendors. If you’d like to see one of the world’s largest marine geysers, visit the scenic peninsula of Punta Banda, home to La Bufadora. L.A. is more than swimming pools, shopping and palm trees. It’s a world-class city that embraces its movie star good looks. Explore the star-studded Hollywood Hills. Visit the world-famous TCL Chinese Theatre’s Hollywood Walk of Fame, which features the handprints, footprints and autographs of more than 200 stars like John Wayne, Judy Garland and Dwayne “The Rock” Johnson preserved in cement. Wander Olvera Street for authentic colors and tastes of Old Mexico. Embrace the enduring allure of beautiful Monterey. Take the coastal 17-Mile Drive, and admire glamorous mansions overlooking ocean vistas. Stroll the fabled waterfront district of Cannery Row, made famous by John Steinbeck. Today, this fabled waterfront district is an eclectic blend of specialty shops, local artists’ galleries, restaurants and the renowned Monterey Bay Aquarium, home to more than 600 species including those native to California. Relax on a sun-soaked beach. Take a tour of the county’s thriving wineries. ‘Ooh’ and ‘aah’ over the 4,000 rare animal breeds that call the San Diego Zoo their home. Watch thrilling shows featuring bottlenose dolphins at Sea World Adventure Park. Enjoy that south-of-the-border feeling with a stroll through Old Town. Sample the nightlife – all Classic California Coast sailings stay here until 11 p.m.
You just may leave your heart in this iconic city. Home to cable cars, fog and world-class food, San Francisco is a cosmopolitan city with hip neighborhoods, parks and gardens and a relaxed atmosphere. Take a stroll down Lombard Street, the “most crooked” street in the world. Watch interesting characters flow through Union Square from a coffee shop window. Appreciate 1,000-year-old redwood trees at Muir Woods National Monument. Nicknamed “America’s Riviera,” Santa Barbara boasts whitewashed houses draped with bougainvillea, sapphire-blue water rolling up a rocky coast and palm-lined beaches. Even with all of that beauty, wine and whales may be the stars of this charming coastal city. 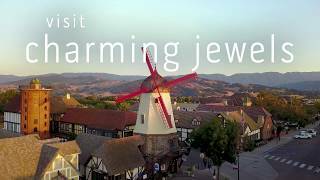 Journey to the quaint Danish village of Solvang for wine tasting. Step aboard a high-speed catamaran and cruise out to the glistening waters of the Channel Islands to watch whales and dolphins frolic. At 110 years old, Seattle’s Pike Place Market is the country’s oldest continuously operated public farmers' market. It’s also home to the original Starbucks, where javaphiles toast to the legendary coffeehouse. Let your eye guide you to local art, and your nose to hole-in-the-wall eateries, along eclectic streets. Tour and sample the wines hidden away in the state’s most popular wineries’ private cellars. If you’re looking for adventure in Vancouver, gather up your courage for a daring walk across the nearby Lynn Canyon Suspension Bridge swaying 50 meters high. Stop and smell the cherry blossoms in world-famous Stanley Park, a West Coast rainforest fittingly dubbed the “Green Heart” of Vancouver. Ascend Grouse Mountain in the Super SkyRide tramway for a postcard-worthy view of the city over rolling hills of Douglas firs. Read about the must-see attractions, unique cuisine and the West Coast’s signature style you’ll encounter on a California coastal cruise. If you're a wine enthusiast who'd love to explore some of the renowned wineries the continental U.S. has to offer, it's time to plan a cruise. Though it's a single state, California makes up more than half of the West Coast in the U.S., affording it some of the most beautiful weather, Pacific coastline and destinations in the country. When you arrive in Catalina Island, you'll feel more like you're in the roaring 1920s than modern-day Southern California. Plan a cruise and see for yourself! The influence from Asia and the Pacific makes Vancouver's food some of the best in Canada. Take a cruise from Vancouver and enjoy the flavors of the city. Whether staying in San Francisco for a few hours or a few days, passengers on a cruise ship will be hard pressed to avoid falling in love with this quaint yet bustling metropolitan city. Our guests share their favorite moments from the beautiful California Coast on Instagram and Twitter and we can't wait to see yours. Use the hashtag #comebacknew and your photo could be featured in our gallery. Princess offers affordable flights, hotels & ground transportation options to make planning easier. Add peace of mind and a sense of security to your vacation with a Cruise Plus® Hotel Package. Give yourself a few days to relax either before or after your California Coast cruise and take in the sights of a sensational city. Princess handles all the details – including transfers and baggage handling – with accommodations selected for their incredible locations and excellent service.